A pilot 200-hour Intensive ESOL course in partnership with Sunnyside Community Services, the Literacy Assistance Center, and Workforce One. Our class met for 8 weeks Monday-Friday from 9am-2pm. 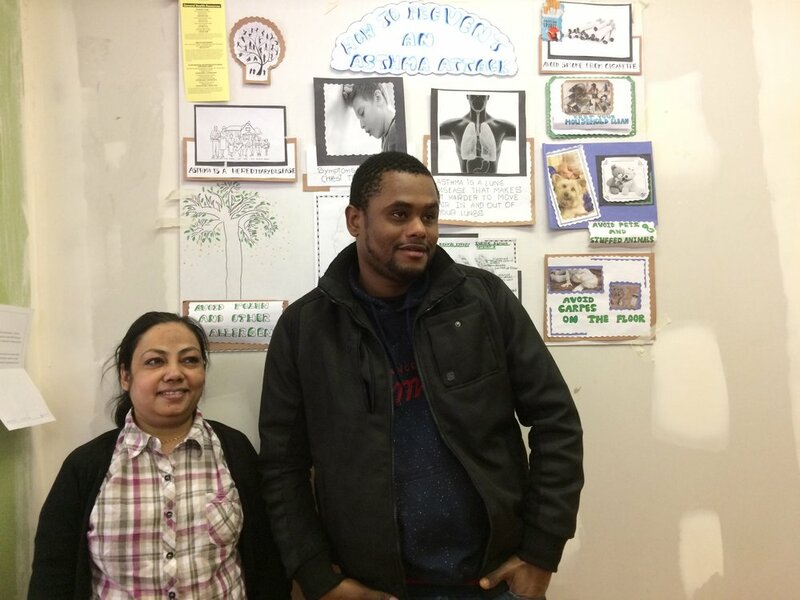 Our goal was to elevate students' English skills in preparation for Home Health Aide training, certification, and job placement through Sunnyside Community Services. I taught lessons from a health curriculum designed by the Literacy Assistance Center. I made modifications and provided differentiated instruction to support mixed levels. I created powerpoint presentations, custom handouts, and visual aids for every class. I administered weekly assessments. Based on scores and in-class observations, I adjusted lessons to allow for additional practice and support as needed. I encouraged peer-to-peer learning, and devoted weekly class time to learning strategies and online resources for self-study. Students worked in small groups to perform independent research projects which included designing a health poster and giving an oral presentation on one chronic disease. Students worked in small groups to design posters about a chronic disease of their choosing (e.g. a poster on Asthma above and a poster on Diabetes and Lung Cancer below). Students gave oral presentations about the chronic disease they researched, its symptoms, causes, and steps for diagnosis, treatment, and prevention. For this activity, students got into small groups, chose a photo, and wrote a story about the person in the photo. Students read stories written by other groups, wrote questions about the story, and proposed a story title. Story writers returned to their papers to read their stories' new titles and to answer the questions their classmates had left them. Food students prepared for our last day of class celebration.